We get so many different personalities of dogs at Ruff Beginnings Rehab. It’s really a joy for us to see how diverse dogs are with personality and breed traits. What we seem to see the most, as far as clients struggling with their dogs, are those strong breed characteristics overwhelming the dogs state of mind and as a result, damaging the owner’s quality of life with their dog. The main differences I’m talking about is the pet dog brain vs the working dog brain. Now there is a lot of cross over of course, but just to keep it simple, here are a few examples. Border Collies-They have high levels of sensitivity to movement and sound and have energy for days. Pit bulls-They have high prey drive and are often very lazy or very energetic. German Shepherds-They have protection instincts mixed with sensitivity to movement and sound (herding qualities) with a strong sense of pack mentality. Vizslas-They have endless energy their entire lives with a need to constantly sniff and investigate everything. Labradors-They have an affinity for getting into things with a fearless mindset. Jack Russel Terriers-These dogs tend to guard resources from other animals and are very intense in every part of their lives. Cattle dogs-They love to control their environment and any movement with their teeth. These may be qualities you like or don’t like, but they are breed instincts and show up strongly in many dogs or even mixed breeds. Many people get a specific breed or breed mix of dog and luckily get these qualities on a low, work-able level where basic training is enough and they are quite happy. 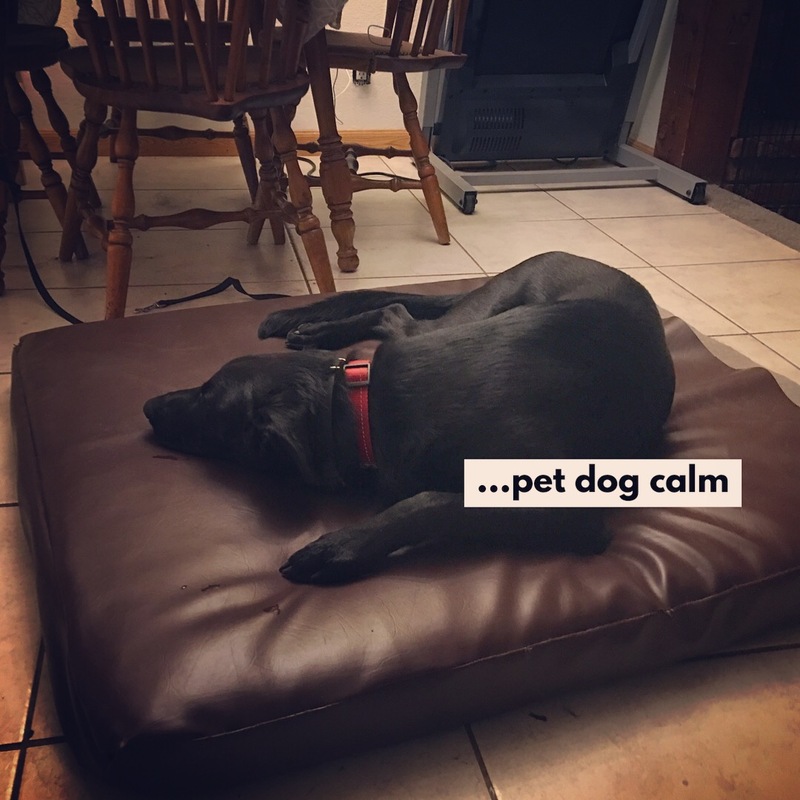 Then many people get a dog with a high level of these instincts, what they are bred for and cannot control many aspects of their dogs behavior. This is a reality so many people face even without dealing with serious genetic behavior issues like fearfulness or aggression. We often want these amazing breeds with these amazing capabilities without knowing what we could possibly get ourselves into since we often don’t run a farm, go hunting, have herds of cattle or need a dog to keep critters out of the barn, jump into freezing cold waters to grab fishnets or have a large property for a dog to monitor. That is what these animals were bred for, so helping them fit into a different lifestyle can be very difficult, even for skilled handlers. I love these two pictures because both of these dogs are very well trained and are trained to be calm on command. 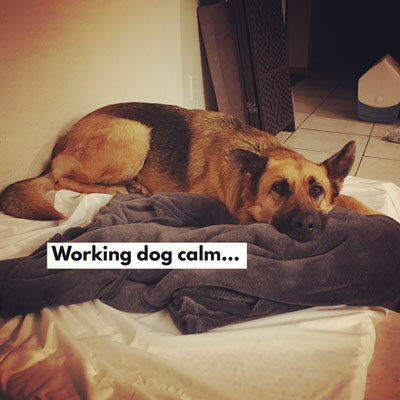 We have the crazy German Shepherd brain, Ginger and she was still staring at me off and on for an hour before going to sleep, whereas Pepper was happy to curl up and go to sleep within five minutes. Two German Shepherds with pet dog vs working dog brain. Now don’t get me wrong, Ginger will sleep in place, even during the day, otherwise we wouldn’t be doing our job right, but it is more difficult for her to settle on her own and go to sleep without being told to go to a spot and lay down for a long period of time and after proper constructive exercise that drains her physically and mentally. Then there is Pepper, who is very eager to learn new things, and is very good at it and follows instructions well just like you would expect of any GSD, but she definitely has a different mindset and temperament than crazy driven working dog Ginger! That doesn’t mean that one is desirable over the other, however I can honestly say that if Ginger’s family wasn’t so active, and so dedicated to structure that they would really struggle with Ginger, whereas with Pepper, of course they might have some issues, but it wouldn’t be on a scale where it would make them miserable. While they both need training and structure to maintain this awesome state of mind, when you do get a dog and you’re looking at breeds, you do have to take into account their temperament, breeding, their state of mind, where they come from, all in comparison to your lifestyle. Now if you rescue, you should always foster to adopt so you can learn about that dogs temperament to see if it is a good fit for the family energy and state of mind-wise. It’s not just about loving the dog, because honestly, we can fall in love with most all pups, but we have to be responsible in our decision to see if that dog’s quality of life will be great as well as our family’s quality of life. If you already have a driven dog driving you mad, don’t fret, but start saving your pennies to get professional guidance and training. You are not alone, but you definitely would want to seek some guidance before things get out of hand. No one expects you to be able to handle anything on your own, but before you get your next dog, maybe just remember this article and do extensive online research for breed history as well as youtube some awesome dogs doing what they were bred to do so you are prepared for potential outcomes. We all start by learning from mistakes, or dare I say failure. It’s how we all learn and grow, so hopefully this article can help someone out there looking for a dog or puppy, or to better prepare them for their next canine companion.